Which flooring you choose for your bathroom can be a difficult choice to make, as your bathroom floor will naturally encounter a lot of water spillages and humid conditions. Therefore, the flooring you choose needs to be able to withstand a harsh, bathroom environment. If you’re finding the decision difficult to make, then keep reading to discover expert advice on which flooring materials are suitable for a bathroom and what you should take into consideration before making your final decision. 1. What should I consider before choosing my bathroom floor? 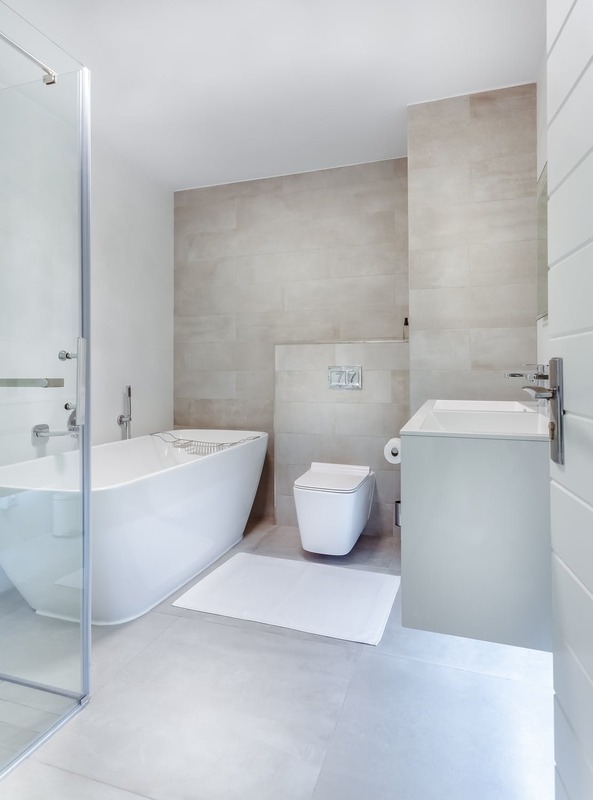 All bathrooms will encounter a lot of water and humidity, which are the most important things to take into consideration when choosing your bathroom flooring. 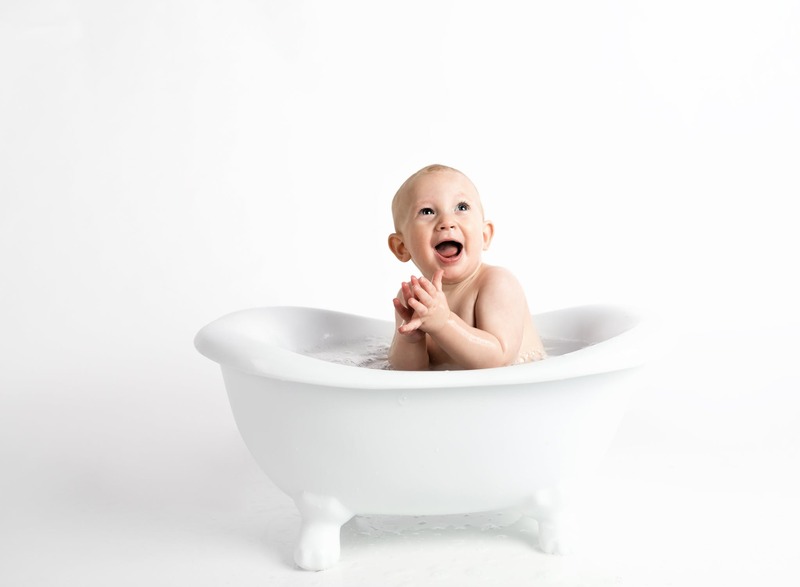 In the bathroom, it is very difficult to avoid spillages, so it is especially important to make sure the flooring you choose is slip resistant, especially if you have younger children or elderly people with your home. 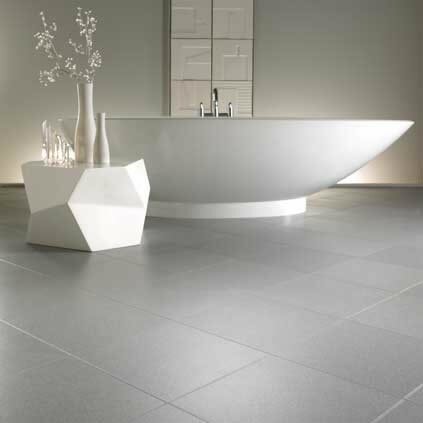 As well as wanting to make sure you choose the most practical and safe product, you also need to make sure you love the look of your new bathroom flooring. Many people like to go for the traditional tile effect, but now there are many other design options available, such as wood effect, mosaics and many abstract modern designs. We are sure you will be able to fall in love with a design that also caters to the specific needs of the bathroom environment! So let’s see what material options are available! 2. What bathroom flooring options are available? Our number one recommendation for a bathroom floor would always be Luxury Vinyl Tiles. These are water resistant and slip resistant, which makes them perfect for an area with spillages! Luxury Vinyl Tiles can also be installed over underfloor heating, which is a massive pro if this is something that is being considered. Most laminates can be used in a bathroom, but come with the risk of the water soaking into the boards and causing issues with warping and problems to the design layer. 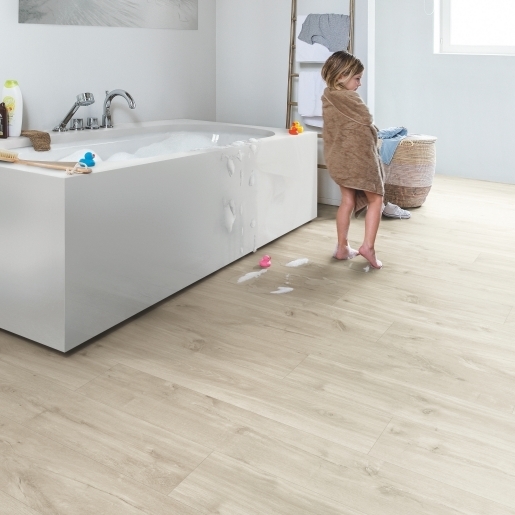 But now we have Aqua Step, which is the perfect laminate product for your bathroom! Aqua-Step have the only 100% waterproof laminate in the market, which is perfect for residential and commercial properties. Aqua-Step is also flood resistant, so whether the spillages are small from children splashing in the bathtub, or whether someone left the bath running for an hour, Aqua Step will be able to cope with all of this, which just puts your mind at ease. The Aqua Step range consists of warm wood colours and also modern tile effect designs, so chances are you will find something suitable for your bathroom. Although these ranges are not 100% waterproof, they are water resistant, and with the use of Quick Step’s HydroSeal water-repellent coating, they can withstand sitting water for up to 24 hours. The ranges which are manufactured using the HydroSeal coating include; Impressive, Impressive Ultra, Majestic and Eligna. 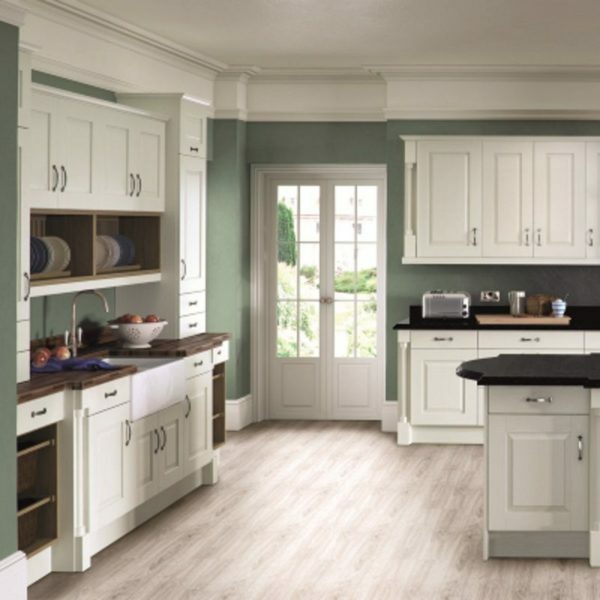 These ranges include both modern and traditional wood effect designs, making it nice and simple to find a product which will complement your interior. 3. How do I decide which option is right for me? The most popular type of flooring for a bathroom is probably vinyl, however, it depends on your lifestyle and how much time you want to spend maintaining your bathroom floor. Plus, not to mention your personal taste and budget! Laminate flooring will always have a modern and fresh look, so it could be a good choice. 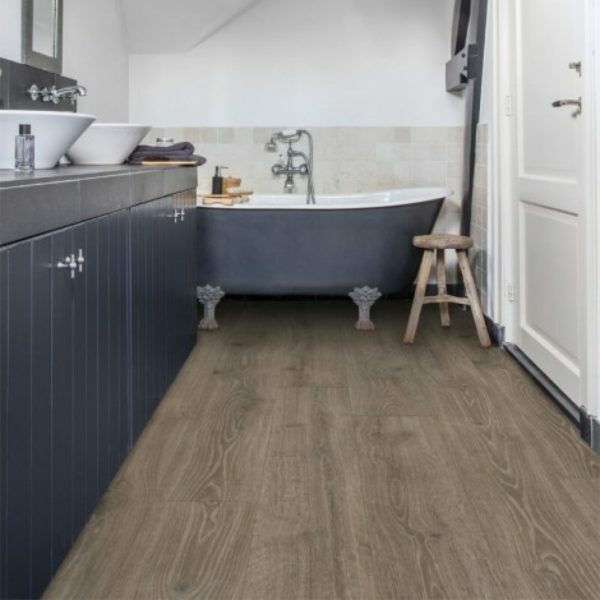 However, as vinyl is more suitable to deal with a bathroom environment then you could choose vinyl tiling which has a very similar look to laminate or check out the Quick-Step Laminate flooring options. Can I use Real Wood Flooring in my Bathroom? Real wood can be used in a bathroom but can be very problematic. Wood and Water are not the best of friends! Especially when it comes to flooring. Any standing water can seep into the wood which can cause warping and issues with the finish and colouring. Also due to how humid bathrooms can get due to hot showers and baths, this can cause swelling to the boards, which may end up in you having to replace the flooring. We wouldn’t really recommend using wood in a bathroom area, as many man problems can occur. It would also be wise to leave a 20mm gap between the planks and wall when fitting, this will probably be hidden by the skirting boards anyway but it will just allow the wood to expand and contract without restriction. But with the amazing and realistic designs available in LVT’s and bathroom laminates, you don’t need to compromise the look of your flooring for practicality and safety! You can have it all! 4. How do I care for my bathroom floor? This completely depends on what material you’ve chosen for your bathroom floor. Vinyl is a great choice for a bathroom as it’s waterproof and easy to clean. However, it’s important to try and clean up any spillages which may occur right away, as if they’re left they can damage the flooring or become harder to clean. It could be wise to get into the habit of cleaning up your flooring right after a bath/shower. Mop frequently and try to sweep beforehand to remove hairs and dust. Firstly, you need to make sure that you’re choosing a laminate flooring material which is suitable for a bathroom, otherwise, you may end up replacing your flooring sooner than you think. When it comes to cleaning laminate flooring in your bathroom ensure to remove dirt and dust by sweeping daily. Also, ensure to mop the floor at least once a week but make sure to do it with a well wrung out mop. As if any water is left sitting on top of the floor it could cause serious damage to it. As the flooring in your bathroom will experience a lot of water spillages it’s wise to clean the floor on a more regular basis than other rooms in your home! We hope you have found this guide useful and inspirational. Head back over to BestatFlooring website here to choose the perfect flooring for your bedroom.